Gilbert loved visiting his grandmother's clothing store. He'd sit next to her while she sewed and draw beautiful gowns and costumes. Gilbert dreamed of someday bringing these drawings to life. But one day, his father took away his art supplies and tore up his drawings. Surrounded by building blocks and Erector sets, sports gear and slingshots, Gilbert's colorful, sparkly, glittery personality started to fade, and he, too, became gray and dull and ﬂat, just like the Kansas landscape. "When I grow up," he dreamed, "I'll go somewhere that's ﬁlled with color." 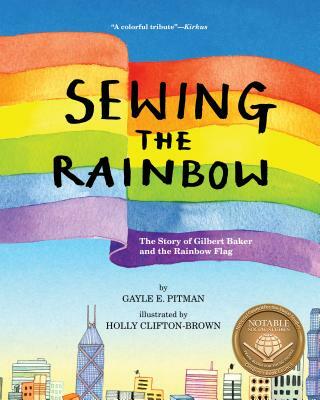 Gilbert Baker always knew he wanted a life full of color and sparkle. In his small, gray, flat Kansas hometown, he helped his grandma sew and created his own art whenever he could. It wasn't easy; life tried over and over again to make Gilbert conform. But his sparkle always shone through. He dreamed of someday going somewhere as vibrant and colorful as he was.